There is absolutely nothing that one should be wary about when embarking on a musical adventure with Ray Lyon. He captains a svelte ship with a crew of three, appropriately entitled Trinity One, with consummate skill and, as the trio undertakes their atmospheric voyage, Mr. Lyon comes into his own building bridges from the past to eternity. This is an impressive album, both in the quality of the playing and in the sensuous music. Ray Lyon’s music combines the use of a beautifully-tuned piano, other keyboards and electronic paraphernalia, with the meanderings (equally glacial as his own) of bassist Jimmy Haslip and drummer Bill Berg. Haslip occupied the bass chair in realm of the Yellowjackets for many years before lighting out on his own musical and producing adventures, he makes a wonderful soulmate for the pianist, while Bill Berg once kept things in tempo for Bob Dylan on Blood on the Tracks. With Haslip’s delicate sound of thunder and Berg’s masterful colourations – whether he is tattooing the skins with sticks or mallets, or ‘stirring the pea soup’ to perfection – it’s hard not to stand riveted before Ray Lyon’s musical canvas. 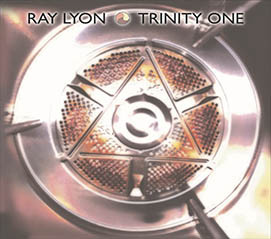 The beguiling begins from the first bars of Trinity One Δ and immediately one is seized by the manner in which Mr. Lyon caresses the keys of the piano, using arpeggiated figures with virtuosic skill. The intensity of his playing is uncompromising and is equally matched by Haslip’s strong, focussed bass lines as well as the urgings of Berg’s gentle whispering. The tenderness and aristocracy are characteristics of all of the music, throughout Trinity One. It would seem that the performing instructions on the score to all three players appear to be ‘not too fast and always singing’. There also seems to be a Zen-like stillness to the music, which, of course, in said Zen-like manner dwells where the heart beats and the blood flows in quiet contemplation. Ray Lyon’s superb take on Miles Davis’ classic piece Solar (which Mr. Lyon calls “Flare”) is where the magnificence of the music reaches its zenith. In this song Ray Lyon yields nothing to Miles Davis’ own recording in his (the pianist’s) accuracy and passion, the recording capturing the full range of Mr. Lyon’s tone in a rich, but not over-resonant acoustic. In the other fare – originals by Ray Lyon – such as “Ezekiel’s Wheels,” one is treated to meditative pieces with a folk-like insistence on a drone note. Arpeggios on the keyboard and elegant triplets characteristic of Haslip, are immaculately delivered, as they are in the complex textures of other music (notably “In the Day of Small Things”) which augurs well for the finale “So Be It.” The flawless tempi and insouciantly elegant textures of the music, suggest that the music always has direction and stays rooted in music written in the fires of idiomatic fusion, extending from Chopin to Zawinul and in Hancock as well as Cecil Taylor. No matter what the music aligns itself with in terms of style, it is always uniquely Ray Lyon in tone and manner.